Single Pole Switch - The 'Single Pole' portion of the name has to do with the fact that it interrupts one pole or a 120 volt side of a 240 volt service. This does not mean that a single pole switch cannot turn on multiple lights. You can have multiple fixtures controlled by one switch. The only limitation is the circuiting for you lights. Single Pole Dimmer Switch - Same as single pole switch for wiring purposes. Switch contains a 'dimming' mechanism that allows you to control the amount of power that goes to the light fixture. This can give you 'mood lighting' and 'task lighting' as desired. Not all light fixtures and bulbs will function properly with a dimmer switch. Check the information for you fixture and bulbs before switching to a dimmer. Three Way Switch - This style of switch allows you to control one light or group of lights from two different locations. 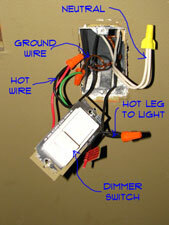 Three way switches need to be allowed for in the rough wiring that is inside the walls. So it is not easy to add one to an existing house. Three Way Dimmer - Yes there are three way dimmers available. However, you can only install the dimmer at one of the three way switch locations. You will have to decide which one you want to have the dimming capabilities. Not all light fixtures and bulbs will function properly with a dimmer switch. Check the information for you fixture and bulbs before switching to a dimmer. You can select any of the above light switch options in several shapes and styles. As long as your wiring and fixtures allow for a particular switch, it is mostly a matter of preference.